We put up the 4th week of our spring Exhibit at the Gardens. My volunteers look forward to doing it even though it is chaotic. We have to take out the past weeks old faded bulb flowers and put in new fresh ones. Seeing the cheery daffodils, beautiful tulips, elegant bleeding hearts and vibrant hyacinths that one of the other horticulturists grows for the exhibit, is so refreshing at this time of year. Especially on a gray darkish day like we sometimes have in March. It really gets our hopes up for spring! If you receive or buy a potted tulip or hyacinth or daffodil for Easter, you can save it and plant it outside to bloom another year. The simplest way is to plant the whole pot in the ground after danger of frost is passed. Another way is to care for the bulb foliage in the pot, giving it light fertilizer and partial sun. Once the foliage has turned yellow , cut the leaves off and take the bulbs out of the soil and store in a mesh bag, hanging it in a dry place like the garage. Tulip bulbs are especially prone to rooting if they stay too moist all summer. Then replant the bulbs in the fall. Bulbs that have been forced used up a lot of energy so they will not flower again the next year. It may take 2 or 3 years of growing and storing energy from the sunshine before they have enough energy to bloom again. A lot of tulips actually don’t come back well. Species tulips and old varieties are more likely to come back again. Hyacinths usually come back and bloom again and daffodils come back very well. You can even get daffodils to naturalize very well. Enjoy your beautiful flowers this Easter and then enjoy them for years to come! Eleven weeks to go til Memorial Day. The race is on for me at work. I received most of my seeds during the past few days. That’s always exciting… better than a birthday present even! All my seeds are annual flowers and vegetables. I ordered 99 different varieties of seeds! I went through all of the seed packets that I received and highlighted information such as when to start the seeds and at what temperature. Many of the seeds can be started at around 6 weeks before the last frost. I use Memorial Day as my “Blast Off” date and count down my calendar marking each week. So, this week is 11 weeks before Memorial Day. April 5th Sunday would be 7 weeks before and so on. A few seeds like petunias, impatiens, and alpine strawberries are planted at 10-12 weeks before the planting out date so I’ve done most of those already. The first 2 full weeks in April will be when the most seeds are started including marigold, phlox, tomatoes, verbena, ageratum and some zinnias. Four weeks before the Holiday some zinnias and nasturtiums are planted. Of course lots of veggies are planted outside, such as carrots, lettuce, beans, pumpkins, and squash. Some plants just don’t do well when started inside. The cool weather seeds such as peas, beets, carrots, radishes, and spinach can be planted outside even before all chance of frost is finished. They can tolerate some frost. And in fact, they like cooler temperatures to germinate and grow in. Other seeds such as squash, pumpkin, corn, and cucumber like to have warm temperatures to germinate and grow in. Those seeds we will plant after Memorial day. By the way, the Red Wing Blackbirds are back, the Turkey Vultures have returned and the Spring Peepers are peeping in my back yard! Those are true signs that spring is coming soon! Posted on March 7, 2009 March 2, 2011 Author JudyCategories Seed StartingLeave a comment on Countdown! You can have your landscape and eat it too! Anyone can grow fruits or vegetables in their own backyard. No special garden plot needed! Edible plants can be tucked in a number of spots in an existing landscape. The only requirement is enough sun which in most cases is 6-8 hours of direct sun. Any vegetable can be grown but some look better than others, so they can be put in more noticeable spots. Some plants that are being used for landscaping are swiss chard, parsley, everbearing strawberries, lettuce, kale, cabbages, peppers and many kinds of herbs. Best results can be obtained if the soil is improved directly around the edible plant. Also, during dry spells, they will probably need supplemental water. Blueberries and dwarf fruit trees such as apples, pears, peaches and plums are a good choice even though they need a few early season sprays. Grapes on a fence or arbor can add quick privacy. There is even a hardy Kiwi vine for our hardiness zone. Just think of walking out into your own yard in the summer and picking peaches off your own tree. Nothing tastes better! 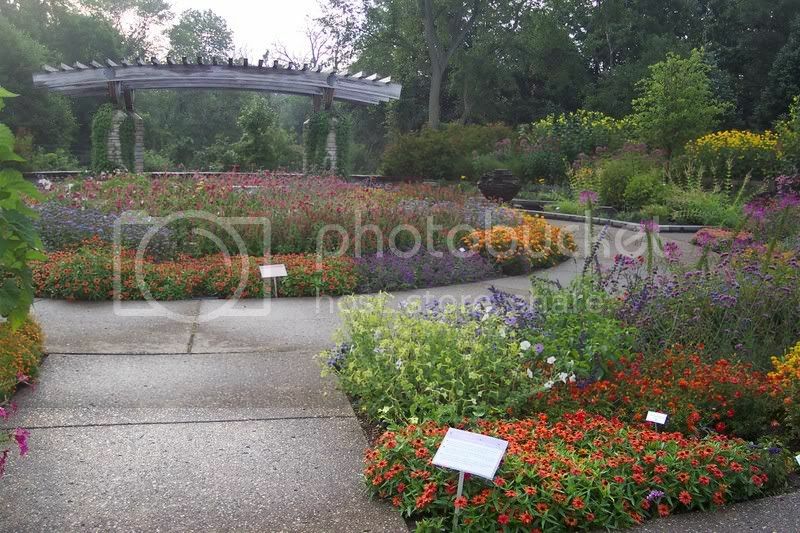 Posted on February 28, 2009 March 2, 2011 Author JudyCategories Flowers, Vegetables1 Comment on You can have your landscape and eat it too! Some seed catalogs have arrived already. Enjoy the pictures of flowers and vegetables for now, but, when you start to order seeds and plants, read the descriptions thoroughly. Look for plants that like your climate conditions, paying close attention to the hardiness zone for each plant. Also note requirements for light, size and spacing. If you are a beginning gardener, you’ll enjoy your garden more if you don’t try to push the limits. For example, if the plant description says it is hardy to zone 7, don’t think maybe it will grow on the south side of the house where it is “protected”. You will be just asking for headaches and disappointments. 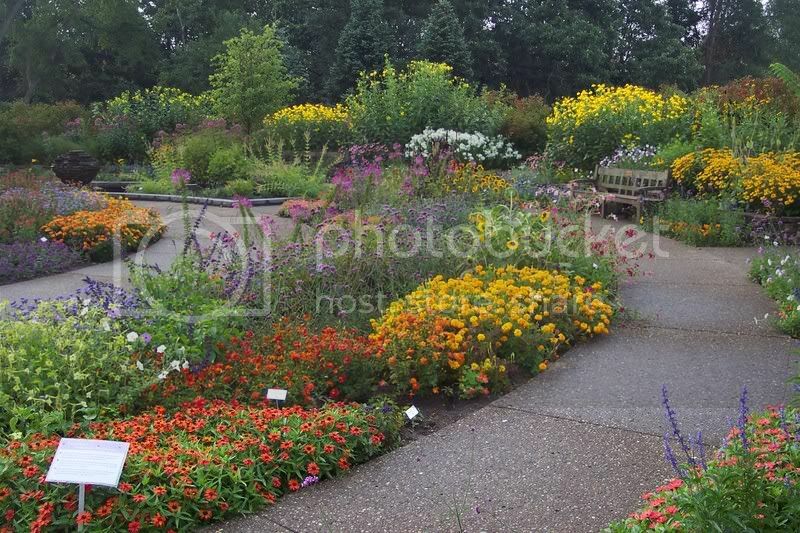 Get to know plants that will do well here in southeastern Michigan (zone 5/6). If the description says it’s easy to grow, then it would be a good backbone plant for your garden. Think about getting your garden soil tested. That way you’ll know for sure whether it is acid or alkaline. A complete test will also show what plant nutrients are lacking in your soil. Some tests include the soil texture as well, that is, whether it is sand, clay or loam. You also need to know if your site drains fast or slow. Some plants won’t tolerate “wet feet”. How much sun or shade does your garden get? Early morning sun until about noon, even though it’s for 6-8 hours, is more like “partial shade. While 6-8 hours of sun in the afternoon is more like “full sun”. Look for plants that grow the way you want them to. Do you need a tall upright foliage plant in a certain spot? Then don’t talk yourself into ordering a medium-high, bushy round plant just because it has a flower color that you fell in love with. As one gardening friend once told me, “now’s the fun time of gardening… no bugs, no heat, no drought, no aching back. Just beautiful dreams of what you want your garden to look like”. 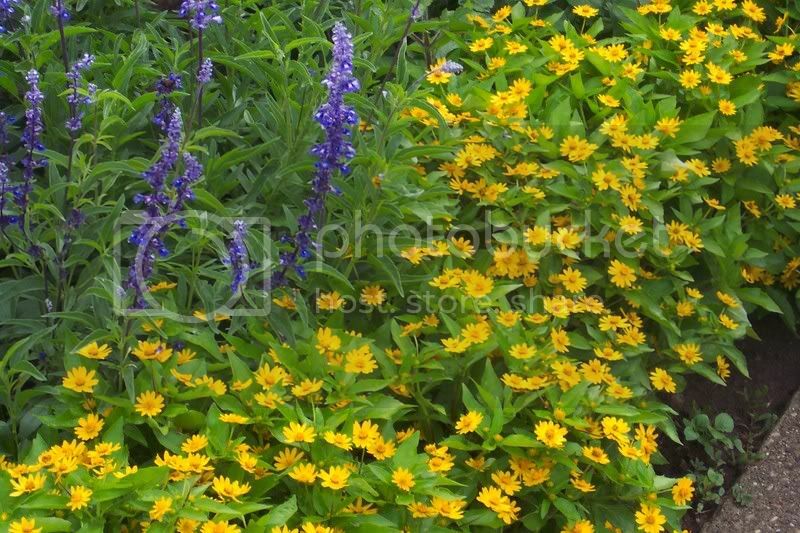 One of the annual flower color combinations that did well together this season is a blue and gold patch in a skinny bed two feet deep and ten feet long. It has a medium dark blue Salvia with the varieity name of ‘Gruppenblau’ (which is German and must mean some kind of blue) in the back of the bed. 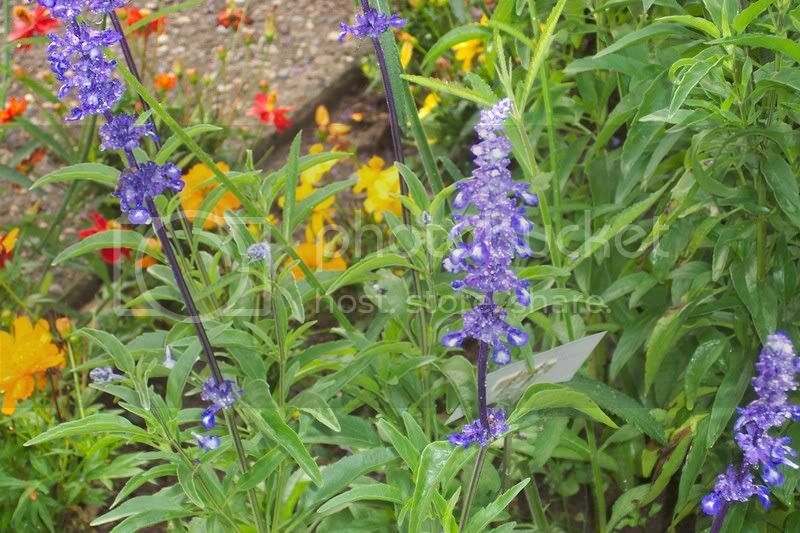 With a medium green coarse leaf and tall (24 -36 inch) wand like spikes covered with small two lipped petaled flowers, this blue salvia is at the top of my list of favorite flowers. Last year we saved seeds from it from plants that were taller than the rest and had slightly bigger flowers. That’s what I planted in this spot and was rewarded with all of these plants being about 36 inch tall. Even the stems of the flower are tinged with blue. It is very striking. In front of the salvia is another favorite flower called Melampodium ‘Showstar’. this is the combo to plant if you want no maintenance! Healthy, full, rounded, 20 inch tall, lots of yellow gold 1 inch daisy blossoms. It has no disease and a great shape. 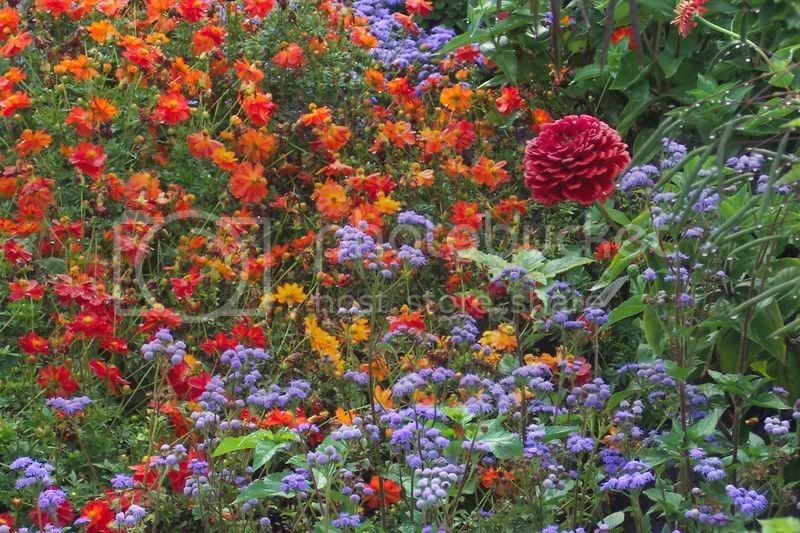 The salvia’s tall and spikey shape complements the round full and shorter Melampodium. Both of them are still at peak bloom , have never needed deadheading and the leaves of both are still looking fresh and bright green. 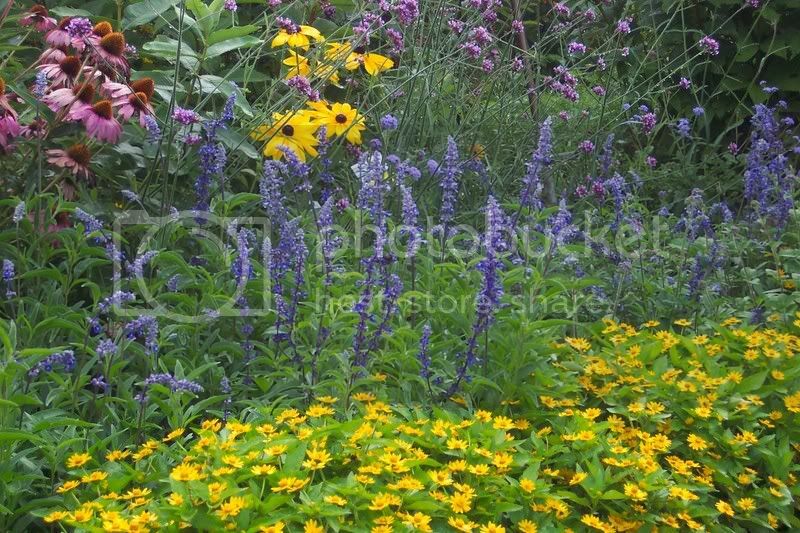 These colors look great with the goldenrods and the purple asters of the fall season. Behind me as I sit on the bench is a Monarch nectaring on a white phlox called ‘David’. This is one of the best phlox – it’s resistant to mildew and is always upright with a clean green look. Behind the phlox is a patch of Joe Pye Weed 6 feet tall. Bees and butterflies love Joe Pye, too. 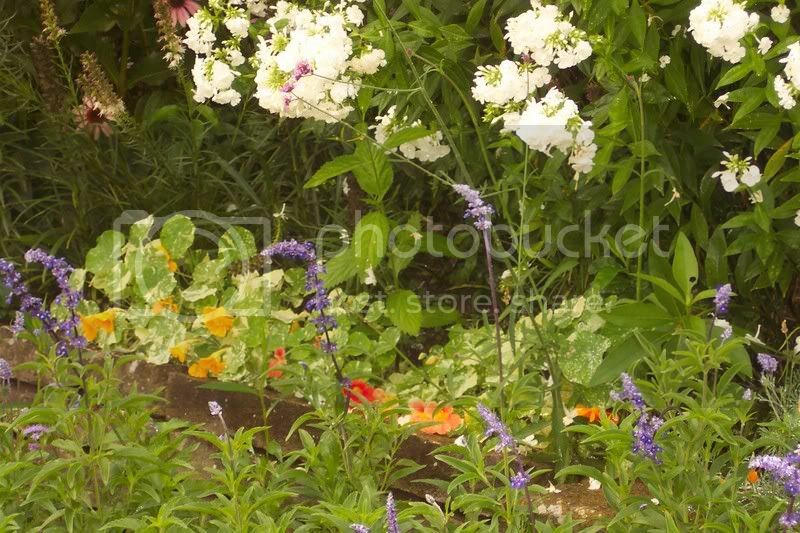 White Phlox 'David' is at the top of the photo. Today since it is almost October would be a good day to go out and pull any poor looking plants and compost them. we have been cleaning up around our beds and cultivating the bare patches when we pull anything out. It makes this rest of the bed look even better. That’s it for today. I am going to go out and enjoy this beautiful weather while it lasts! In In the centers of the beds, in the annual garden that I take care of, are the taller flowers. Cleome ‘Violet Queen’ is 4 feet tall, with a cluster of pure, purple, funnel shaped flowers. It starts blooming early and continues to bloom as it gets taller. It has little thorns on it so I like to keep it away from the outer edges of beds so people don’t accidentally get scratched. 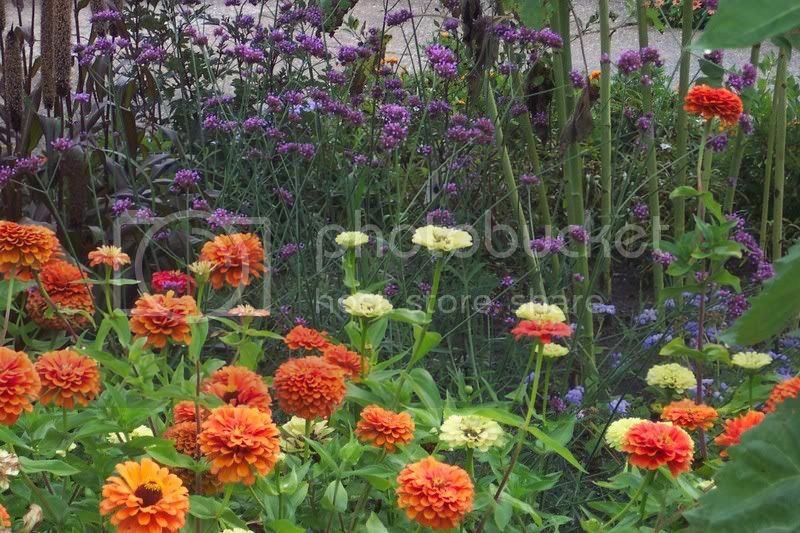 One of our favorite flowers is Verbena bonareinsis. It doesn’t usually have a common name listed, but I think Purple Haze would fit very well. It’s three feet tall with only a few leaves near the base of the plant, and stiff, wiry stems with a cluster of smaller purple flowers on top. Butterflies love it, since it’s not very full looking or thick with leaves , we let it grow where ever it seeds itself. The flowers behind it can still be seen very well. It adds a dusting of purple to the garden. Each bed has a stand of sunflowers in it this year. The one that looks the best in the beds is ‘sonja’. Only 3 to 3 and a half feet tall, it blends in with the other flowers quite well. 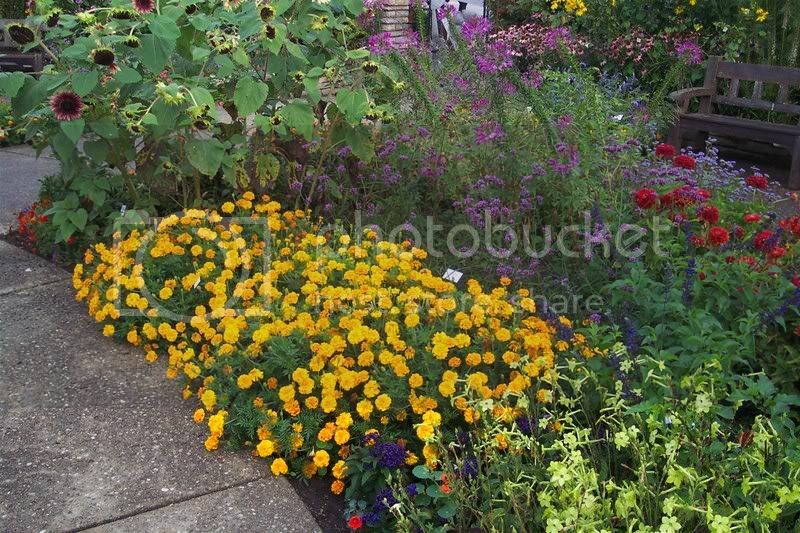 Another bed has a sunflower in it that turned out to be 6 ft, that one looks out of place with the other flowers. 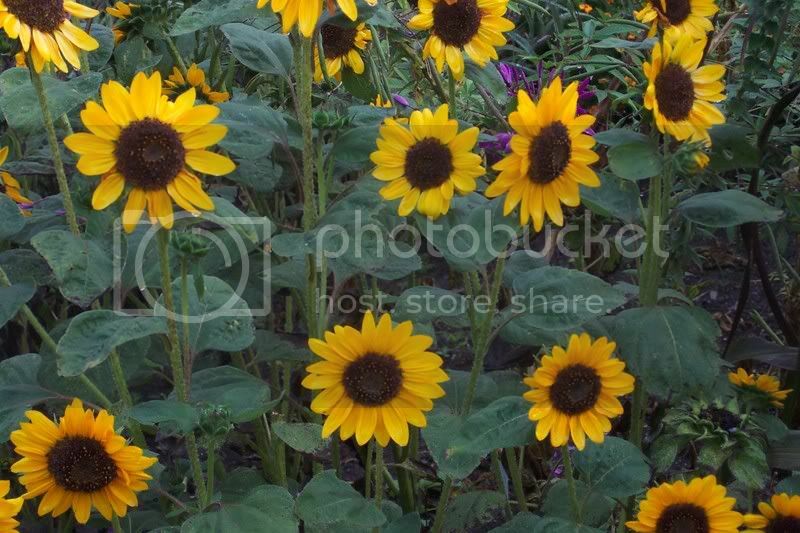 ‘Sonja’ has a small flower head, 3-4 inches wide and dark yellow petals with a dark brown center. Bloomed for quite a while, still is. Plus it attracts, like all other sunflowers, the goldfinches at this time of year. They add alot of excitement to the garden, while they cling to the hanging sunflower heads and jab away at the newly formed seeds. The bumble bees are buzzing around the cleome now. They push their way into the funnel shaped flowers to get to the nectar. 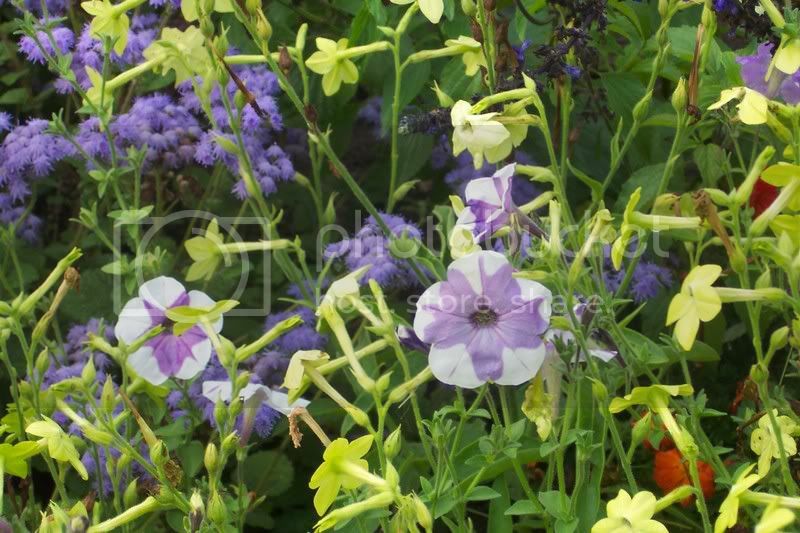 On the other side of one of the beds I can see the pale greenish tubuar blossoms of the Nicotiana ‘Lime Green’, a 18″ -24″ tall flowering tobacco. I think I will under plant the cleome with this nicotiana next year. The cleome gets bare at the bottom of the plant and the green and purple will look good together. Butterflies and bees are all over this garden now that the morning has warmed up. It makes it so alive in here. So much to see. It really is a satisfying garden. Sight, sound, smell and the warmth surrounding me totally make the work that goes into this garden worthwhile. Though with nighttime temperatures in August in the low 50’s , I wouldn’t be surprised if we had temperatures in the low 40’s in September and frost before October this year. Be ready to cover your tomatoes!